Unfortunately the day I went down they weren’t doing peach pie. Just my luck. What that did do is make me venture out. After talking about the different options she told me we needed to try the Pecan pie. Pecan pie is usually a very rich pie, you know, one bite is enough. I had my friend from Inspired2Cook with me. She makes good pecan tassies, so I knew she would be a good judge too. I can honestly say her pie was not too sweet and not overly rich. I mean pecan pie is always richer than berry, but this one was very well done. We both agreed it was perfectly done. It even had a great flaky crust to go with it. 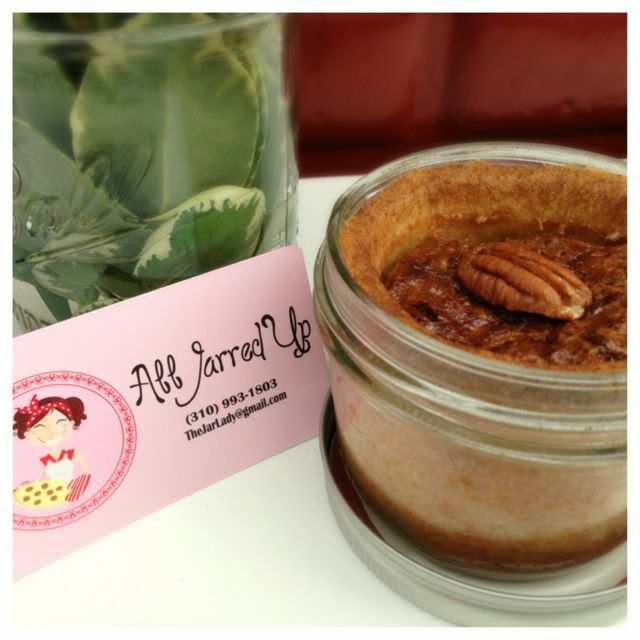 Such a cute name and it is exactly what they offer….pies in a jar. Yep, the pies are in a jar with a lid on them. Grab them and go. But what do you do with this really nice jar? 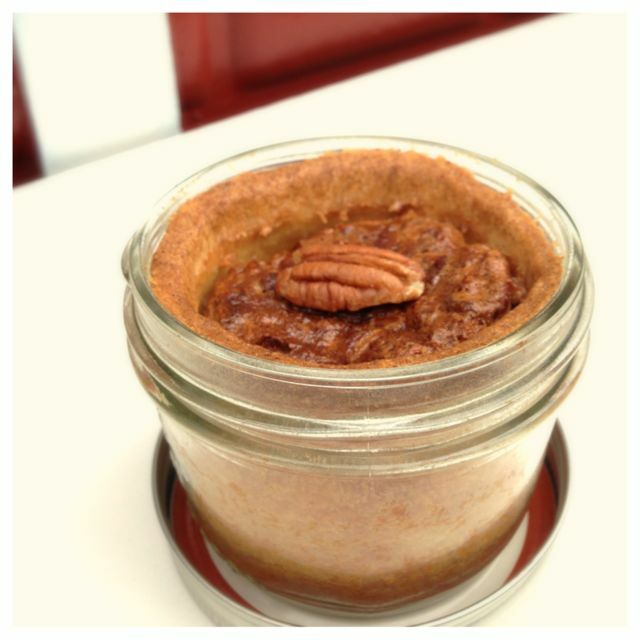 Well, if you decide to go back for more pie, just take your jar back and get 50¢ off your next pie. They just made grabbing pies for your office friends so much easier. They also offer some of their pies by the slice and cake by the slice. Those come in regular to go containers. The owners Teri and Evan. But wait! There’s more….Check out their Etsy store. Love their pie? Want to send some to your friends? You can do that! They ship pies anywhere. Too lazy to walk down there every so often and get your pie, then you might be interested in their Pie of the Month Club. 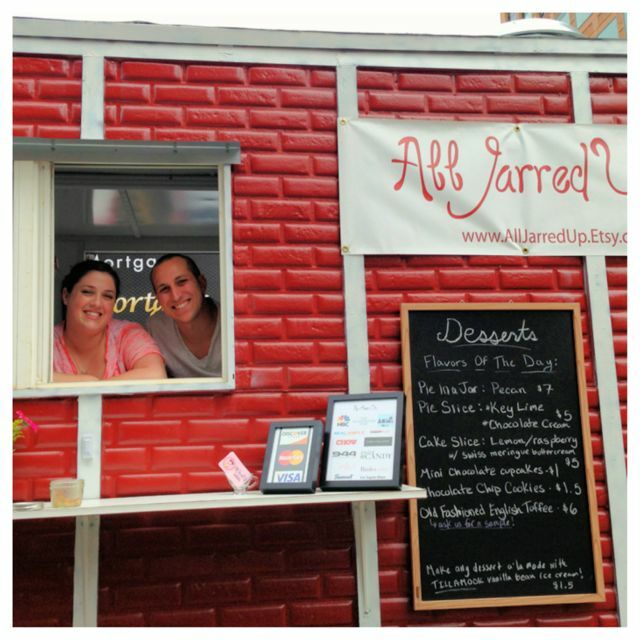 Whatever your pie needs, this food cart has got you covered. Just so you know, it’s not just pie and cake. They also have toffee and cookies. Follow them on Facebook to see what their pie of the day is and their other sweet treats. They change it up often. I am hoping to grab some kind of berry pie before September is over. Atmosphere at this cart is a bustling downtown street, yet this cart sits alone. Service was awesome. They were really sweet answered lots of questions (I always have questions you know). Pricing was good. The jars seem small, but there is a lot of pie in there. We shared one and we both had plenty just sharing. All Jarred Up is located in Downtown Portland. Disclosure: Yes I was invited down to try their pie. Yes I got a free slice. Yes I will be going back to try a berry pie because the first one was so good. And yes, the opinions are all mine and I think if you tried this place your opinion would be the same.